Once again we have reason to celebrate a successful wine tasting. There are so many people to thank, but we will start with Bill Warren from Aurora Liquor who contributed his time and knowledge of vine and wine, and his wife, Gwen, who assisted with selections and pours. We are also indebted to the following businesses that donated food or merchandise for our fundraiser: Bengert Greenhouses, Black & Blue Steak and Crab, Cugino’s Restaurant, Curtiss Hotel, Darwin Martin House, Dash’s Markets, Elbers Landscape Service, Just Pizza, Lone Star Fajita Grill, Mason’s Grille 52, Paula’s Donuts, Raymondo’s Pizzeria, Russell’s Steaks Chops and More, Salvatore’s Hospitality, Share Kitchen & Bar Room, Theodore Roosevelt Inaugural National Historic Site, Trader Joe’s, Watson’s Chocolates (Depew), Wegman’s Markets, and WOOT [Wine] Cellars. Please remember to support them in return by utilizing their services or purchasing their products. 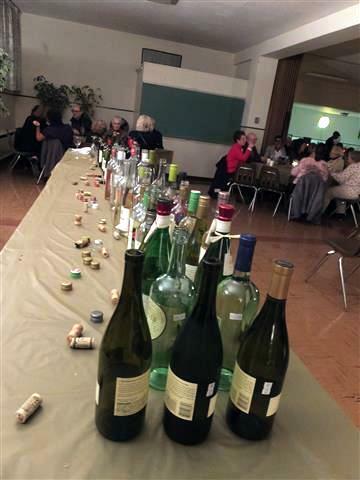 Parishioners and friends who contributed time, raffle prizes, and delicious hors d’oeuvres and desserts are too numerous to list, but we love you all and thank you for your role in hosting such an enjoyable evening.